Trump Is Letting Congress Determine the Iran Deal’s Fate. Here’s What It Can Do. 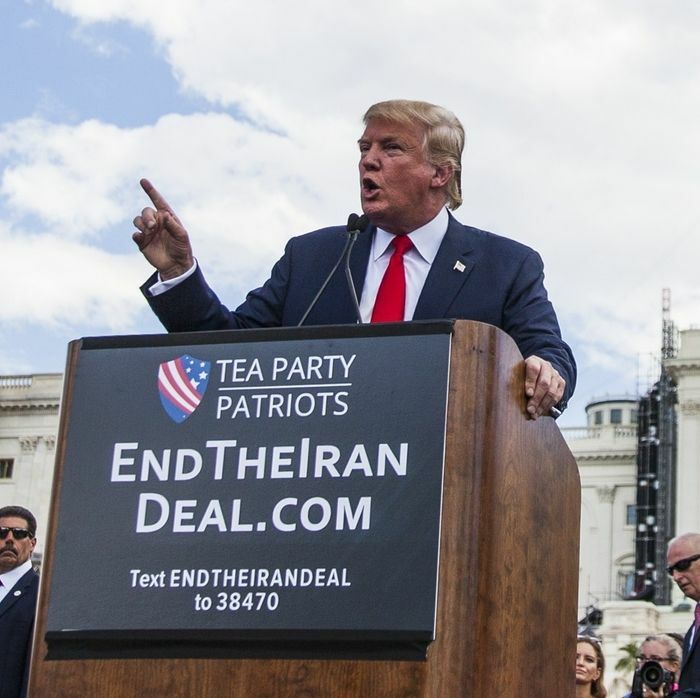 Trump denounces the Iran deal during a rally outside the U.S. Capitol on September 9, 2015. After signaling for months that he intends to wound the Iran deal, on Friday President Trump will announce that he is decertifying the agreement with Iran over its nuclear-weapons program. But what, exactly, does decertifying the deal do? What it doesn’t do is kill it — at least not immediately. As president, Trump actually has the power to scuttle the agreement unilaterally if he wants. The way the Joint Comprehensive Plan of Action, as the deal is formally titled, works is that U.S. sanctions on Iran are not canceled but rather suspended, so long as Iran holds up its end of the bargain. Had Trump wanted to, he could have simply declined to waive the sanctions when they came up for review last month. Decertifying the deal, on the other hand, basically breaks its legs and tasks Congress with deciding whether to patch it up, or put it out of its misery. The JCPOA doesn’t require the U.S. president to certify anything. The certification requirement comes from the Iran Nuclear Agreement Review Act, a bit of legislative legerdemain drawn up by Senators Bob Corker and Ben Cardin in 2015 to give Congress some role in managing the deal, which the Obama administration had not negotiated as a treaty requiring congressional approval. The INARA legislation requires that the president report to Congress every 90 days to certify that Iran is complying with the terms of the deal. It is indeed compliant, as even the Trump administration itself grudgingly acknowledges. However, INARA also calls for the president to certify that the suspension of sanctions on Iran is still appropriate and vital to U.S. national security interests. Trump and officials like U.N. Ambassador Nikki Haley have lately been busy arguing that they are not. Iran, they say, is violating the spirit of the agreement through its ballistic missile testing and its support for groups like Hezbollah, Hamas, and Shiite militias in Iraq and Syria, which the U.S. considers terrorist organizations. Furthermore, they argue, fear of abrogating the nuclear deal limits the ability of the U.S. government to counter Iran’s misconduct in other areas. The case they fail to make is why walking away from the deal and implicitly encouraging Iran to resume its nuclear activities forthwith would give us more leverage, not less. In any case, such is the logic of decertification, which will start the clock on a 60-day period during which Congress can fast-track legislation reactivating U.S. sanctions on Iran. Under the terms of INARA, this sanctions legislation is not subject to a Senate filibuster or other procedural delaying tactics, so it can be passed with simple majorities of both Republican-controlled houses of Congress. How our European partners would ultimately respond is not entirely clear. European companies that have signed contracts in Iran could end up being forced to choose between honoring those contracts and doing business with the U.S. — a Hobson’s choice. The E.U. might try to legally shield these companies from U.S. sanctions, but that could prove more painful than going along to get along. The only sure thing is that withdrawing would drive a wedge between the U.S. and its key allies in Europe. It’s entirely possible, however, that Congress won’t vote to reimpose sanctions after all. While no Republican lawmaker has yet to come out in opposition to scrapping the nuclear deal, a number of them have expressed doubts, including senators Susan Collins, Rand Paul, Jeff Flake, and even John “Bomb, bomb Iran” McCain (Corker, Trump’s new worst frenemy, won’t say where he stands). The Democrats who rebuffed an effort to kill the deal two years ago are also opposed to overturning it. Unlike Trump, who many observers suspect is driven more by his feelings about the agreement than any practical understanding of it, these members of Congress recognize the seriousness of what they’re being compelled to do and what the consequences would be. One possibility is that instead of new sanctions, Congress comes out with a new law or an amended version of INARA including demands for a stronger version of the JCPOA. That could give the administration several months to engage in another round of diplomacy to try to pressure Iran into making a “better deal.” Indeed, this seems to be what the Trump administration is hoping for. The president is expected to ask Congress to wait on reimposing sanctions rather than scrapping the deal right off the bat. Still, the odds are against this administration actually getting Iran to accept harsher terms than the last one did, especially without offering any positive incentives. Renegotiating the deal would also require the rest of our “P5+1” partners to get onboard, and none of these countries want to go through that process again. If these efforts fail, Congress could then impose sanctions — or the Iranians could get tired of us yanking them around and withdraw from the agreement themselves. Of course, there’s always the possibility that Congress ends up doing what it does best: nothing. In that case, the JCPOA simply goes back into the president’s hands until the next certification deadline. This outcome would do lasting and possibly fatal damage to the agreement, however. Having decertified the deal and declared that the waiver of sanctions is not in the national interest, Trump will face tremendous pressure to scrap it unilaterally, both from congressional conservatives and from his own ego. Meanwhile, it would signal to Iran (and other U.S. adversaries, like North Korea) that the U.S. cannot be trusted to uphold its bargains beyond the shelf life of one president.